In the midst of the turmoil at the time of the Biblical Judges, a quiet pastoral story sees two widows, Naomi and her daughter-in-law Ruth, return to Bethlehem. Ruth goes to look for corn and finds a husband, Boaz, whom she marries after first being offered to a close relative of her deceased husband. Ruth and Boaz form a dynasty, from which descends David and the Jewish royal family. Naomi, her husband Elimelech and their sons Machlon and Kilion, leave home in time of famine. In Moab one son marries Orpah and the other, Ruth. Elimelech, Machlon and Kilion die. Orpah goes back to her family but Ruth refuses to leave Naomi and adopts Jewish beliefs and practices. Naomi and Ruth come back to Bethlehem at harvest time. To obtain food, Ruth gleans with other poor people in the field of Boaz – a landowner who has a cordial relationship with his workers. Boaz treats her well. When she gets home, Naomi tells her to continue to glean in Boaz’s field. Ruth hears from Naomi that Boaz is a kinsman and Naomi encourages her to become close to him. She spends the night at Boaz’s threshing floor. Marriage is on the way. A nearer kinsman declines to marry Ruth. The way is now clear for Ruth and Boaz. A minyan attends the wedding. Ruth and Boaz have a son who brings special joy to his grandmother Naomi, and who becomes the ancestor of King David. ELIMELECH (“My God is King”) – descendant of the princes of the tribe of Judah. Husband of Naomi, he dies early – possibly as a punishment for leaving Israel. NAOMI (“Pleasant One”; when tragedy strikes, she calls herself Marah – “Bitter One”) – wife of Elimelech; a woman of courage and forebearance. MACHLON (“Sickness”) – son of Elimelech and Naomi. He dies soon after marriage to Ruth. KILION (“Wasting Away”) – second son of Elimelech and Naomi. He dies soon after marriage to Orpah. ORPAH (“Stubborn One”) – a Moabite who returns home after being widowed. 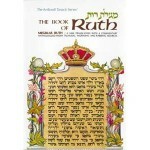 RUTH (“Friendship”) – a Moabite devoted to her mother-in-law and showing constant kindness and modesty. BOAZ (“In Him is Strength”) – a kinsman (possibly a nephew) of Elimelech and Naomi. A wealthy, humane agriculturalist who becomes Ruth’s husband. TOV (“Good One”) – the close kinsman who declines to marry Ruth. OVED (“One Who Serves”) – the son of Ruth and Boaz. He maintains the family traditions and is the ancestor of King David. Book of Ruth – a feminist tract? This entry is filed under Articles, Bible/Tanach, Festivals & Fasts, Shavu'ot.